Fats, Oils and Grease (FOG) produced by commercial kitchens like restaurants, hotels, and cafeterias is much greater in volume and frequency as compared to domestic kitchens. This is the reason, commercial food establishments require specialized equipment called grease traps or grease interceptors that capture the disposed of FOG and let the clear wastewater flow down the drain. This ensures the plumbing system remains functional and safe from the notorious consequences of the FOG-led blockages and backups. Needless to say, having a food establishment requires a full-time commitment and dedication that may put you in a situation where priorities go out of whack – one of them being the maintenance of grease trap and related awareness. 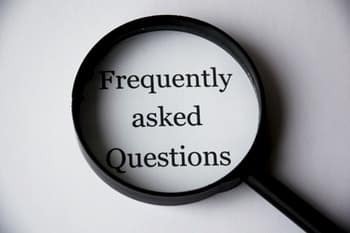 But not to worry, we have a list of FAQs that can get your grease interceptor related issues resolved in a single click! 1. I have a backup in my commercial kitchen sink. What could be the reason? A. If your sink is experiencing back up with a bit of bad odour and gurgling noise, it means that either your grease trap is full or the plumbing line is blocked. The FOG or other food particles can cause blockages in lines between the sink and grease removal unit. Or, your grease interceptor has reached its capacity due to which it becomes non-functional with no way for FOG to escape. For this, you need a grease trap cleaning and unclogging of the line. 2. Is there any difference between a grease trap and a grease interceptor? A. In general, a grease trap and a grease interceptor are interchangeable terms used for any grease removal unit. But technically, a grease trap is a small-sized equipment installed in the plumbing system inside a facility. Whereas, a grease interceptor is a large-sized equipment installed outside the facility, usually under the ground. 3. My kitchen does not involve usage of grease in cooking. Do I need to install a grease trap? A. Yes. A grease trap is an equipment that not just collects grease but also removes fats and oils from the wastewater. Fats and oils are generated from using cooking oil, salad oils for dressing, butter, margarine, shortening and mayonnaise. Besides, grease is generated even while baking. 4. How will I know that the grease interceptor I have installed is working efficiently? A. Of course, you cannot see how the process of separation and filtration is happening down the plumbing line in your grease interceptor. So, the easiest way is to check that the FOG is not entering your plumbing and septic system. If that is the case, you will have to deal with frequent blockages. To know better, you can ask a trusted professional to evaluate your system. 5. Can anyone install a grease trap or I need a specialist? A. It is recommended that a grease removal unit should be installed by a plumbing professional or a grease trap expert to ensure the system works effectively without any flaws. 6. What factors determine my grease trap cleaning schedule? A. A grease trap cleaning schedule is significantly determined by the size of the equipment, the size of your kitchen, sink capacity, the number of dishes cooked per day and use of kitchen appliances like oven. That said, the grease trap cleaning schedule may change depending on the season, business flow and the events organised at your facility. 7. Are grease interceptor additives good for my grease removal equipment? Would they extend the life of my equipment and reduce the requirement for frequent grease trap cleaning? A. In general grease trap additives are known to be beneficial for the equipment. However, some of the concerning authorities prohibit the use of additives considering the fact that they contain compounds that provide temporary relief but may also cause premature clogging and permanent damage to the disposal area. 8. Does servicing of a grease interceptor cost more than repairing or replacing? A. Servicing your grease interceptor at regular intervals is far more inexpensive and effective than repairing or replacing. 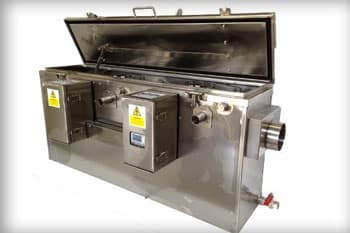 The cost for the service will depend on the size of the equipment and the frequency at which grease trap cleaning is performed. 9. Can I dispose of all the grease down the sink when I have a grease interceptor installed? Isn’t that what it is meant for? A. Grease should never be disposed of down the sink, as it will solidify while flowing through the pipes and cause blockages and backups. This can result in severe damage to the plumbing systems and problems with the city sewage systems which may result in penalties. Grease traps are only meant for collecting residual FOG from cooking. 10. Why does my food facility smell even after I have had my grease interceptor cleaned? The gasket around the manhole cover may be corroded or worn out due to which the gases may escape out of the grease trap and enter your facility. A backup in the line connecting to the grease removal unit may cause clogs, diffusing a bad odour. For this, you will require help from a plumber. Lastly, if the smell has occurred just after grease trap cleaning service, it may be due to the method used. The smell is most likely to dissipate after some time. This is an automatic grease removal unit specially engineered to meet the demands of marine vessels. The equipment removes FOG through programmable skimming cycles that make the operation more convenient for the facility. Have a look at a list of other products. This automatic grease trap unit is tailor-made for bigger marine vessels like cruise liners and navy vessels. Its stainless steel body makes it robust, durable and easy to install in confined spaces. The product is customised to meet the expectations of different marine vessels. Visit the page for a better insight.